After five years in development, the small team over at Gears for Breakfast have released their Kickstarter-hit, A Hat in Time on PC and Mac (PS4 & XB1 coming soon). The game is chock full of charm, with an endearing cast of characters, a snappy, responsive control scheme and an art style that often serves as a nostalgic throwback to the golden age of 3D platformers. A Hat in Time is effortlessly endearing, with fun and imaginative worlds to play around in. However, the charm can be a double-edged sword, as whilst a few of the characters and settings are delightful, many others come across as bland and derivative in comparison. The gameplay loop is tight though, with the titular Hat Kid responsive and snappy in movement, as well as quite forgiving with some of the later tricky jumping sections. If you enjoyed 3D platformers from the N64 and GameCube generations, then A Hat in Time offers you the chance to relive that era in a way other Kickstarted titles may have promised, but not fully delivered until now. Disclaimer: William T. Nicholls, lead 3D artist on A Hat in Time, is a long time member of the Talk Amongst Yourselves community. This connection has not played a role in the content or outcome of this review. A Hat in Time has charm bursting out of its ears. The premise, that a time travelling kid with an affinity for hats must refuel her spacetime-ship, is gloriously campy and whimsical. The story doesn’t make a lick of sense, but then it doesn’t have to. All you need to know, is that through an unfortunate encounter with the Mafia in space, all 40 of Hat Kid’s ‘Time Pieces’ have been spread out across five large worlds (or chapters) for you to go and collect. As Hat Kid finds more Time Pieces, she will unlock more chapters to play around in, with each offering a distinctly different aesthetic and gameplay style. The game is built from the ground up for younger players, however it does plenty to keep adults engaged as well. The characters are lovingly created, with enchanting personalities that fit the games theme of a young girl playing with her favourite toys. Even down to the endearing idle animations, such as when Hat Kid brings out two dolls and makes them kiss, the game is adorable. As mentioned, the story may be irrelevant and somewhat throwaway, but the joy in the characters and settings are not, and they are bound to put a smile on your face. When a game such as this is in development for an extended time, there can be fears that significant problems are the root cause of such a delay (particularly with Kickstarted projects). Fortunately, this absolutely is not the case with A Hat in Time. The game is slick and runs beautifully, and outside of a few clipping issues here and there, there were no discernible bugs or glitches found throughout my 12-hour playthrough. The developers have been able to optimise their engine effectively, a pleasant surprise for an indie game such as this. Throughout the entirety of A Hat in Time, Hat Kid is ultra-snappy and responsive to use. There’s a weight and fluidity behind the character which helps to keep her feeling grounded when running around the levels. I never felt as though I was battling the character to get her to do what I wanted. Hat Kid’s move-set is pleasantly varied. Alongside the standard double jump, she can dash forward across a significant distance, before bouncing out of it with another jump. There’s even a slight wall running/jumping mechanic. By combining Hat Kid’s roster of moves, the player is able to string together jumps and dashes to move through the game very quickly. This, coupled with a few movement upgrades that unlock later in the game (such as a grappling hook), means that traversing through the different worlds at a quick speed is a delight. The developers have encouraged the speed-running community to take up this game, and it’s clear why with such tight control scheme. Gears For Breakfast have employed Grant Kirkhope (of Banjo-Kazooie fame) to guest produce on some tracks in the game. Both his, and Pascal M. Stiefel, the main music producer’s tracks, are suitably fantastic. Each track does a brilliant job of referencing back to the 3D platforming hey-day, sounding nostalgic and as whimsical as ever. Bonus: Full modding support is also included on release, and will launch with official mods such as a gorgeous Psychonauts 2 Hat! There’s a large variety of levels on offer in A Hat in Time (with two more Chapters coming as free DLC), and whilst some may not hit the mark, there are plenty of highlights. As each Chapter offers distinctly different gameplay styles, levels can range from short 2-minutes chases through an exploding train, to a densely packed island sandbox with a multitude of ways to dash, double-jump, and swing through. These keep the game feeling fresh, right up until its conclusion. It also means that backtracking across the multiple levels is a joy, as you adapt your play style to each. Whilst exhilarating the first few times, flying along these rails can start to become a chore. The level design lets itself down slightly towards the later end of the game however. A later Chapter opens up into a broad ‘free roam’ area for the player to discover, and whilst the level provides a nice variety, its layout is confusing and limited in scope. Instead of an open map to traverse through (like earlier in the game) the level is a series of small islands, broken up by a literal on-the-rail system. As such, it functions primarily as a gauntlet of sparsely populated platforming challenges, that just take frustratingly longer to get to than by using the hub menu. As mentioned earlier, the game is focused on the experience of younger players, and as such the difficulty never provides any significant challenge. Whenever the player does lose all of their four health points, they will simply return to the beginning of the nearest checkpoint. There is no significant penalty for failure, however that’s not what this game is about. The challenge arrives in the speed running element of the game. Gears for Breakfast have deliberately looked to encourage speed-running from the get go, even including ‘Skip Cutscenes’ and ‘Game Timer’ options in the menus. This is a fantastic addition, as many of the levels seem built to be taken advantage of, with there being many difficult, yet faster, routes and jumps to take if the player is brave enough. With its responsive controls, and some wide multitiered levels for players to explore, this game seems ripe for speed runners to test their skills. But for every fun oddball character, there are some that are just plain odd. The merchant character in the game, an alien that pops up in levels to sell you badges, just looks unfinished, and is constantly clipping (it’s supposed to be ‘glitchy’ but it comes across as very messy). Yet the majority of characters did make me smile, and I generally enjoyed the often-over-the-top voice acting, but sometimes it’s just not as consistently charming as much of the rest of the game. One of key mechanics in A Hat in Time is its focus on the different abilities offered by each hat the player can equip. As you play through the game, you will collect balls of yarn, with which you can knit new hats. The Speed Hat gives the player a sprint functionality, whilst the Witches Hat lets the player create explosive potions to throw, for example. Whilst the hats are adorably cute, they don’t really offer any significant change in gameplay. Some hats, like the Ice Hat, are incredibly situational, so it often makes sense to just keep the Sprint Hat equipped and then change on the fly when needed. This seems like a missed opportunity, as the system holds potential for giving the player agency in playing their own way. Instead, the Hats end up feeling like a restriction on Hat Kid’s move-sets, as opposed to being empowering. The ‘Badge’ system looks to remedy this somewhat, by offering further customisability with each badge being able to be pinned to a hat. These offer abilities for the player to use, such as a faster recharge of abilities, or a magnet for the collectables. As you can wear up to 3 badges at a time, they offer a better sense of customisation to Hats, enabling the player to be adaptable to the situation at hand. Boss fight coming up for example? You won’t necessarily need your Scooter equipped, better swap it out for the Projectile Attack. It offers a much more general usability than the hats, and as such I preferred it. Whilst the open and broad levels mean that the camera isn’t usually a problem, there are moments of hassle when it’s often in the wrong place. Some of the jumping sections along bouncy cables throughout the game seem particularly hit or miss thanks to this. These are all problems that the 3D platformers of old have had to consistently deal with, but A Hat in Time doesn’t offer any particularly new solutions. If you’re comfortable and experienced with these types of games, it won’t be an issue, however I should note that some younger players may be frustrated at times. Not in a very long time has a game seduced me with its charm in the way that A Hat in Time has. As a throwback to the 3D platformers of old, it has been able to avoid many of the mistakes made by previous attempts at bringing back the genre and made me fall in love with the tight loop of double-jumping, dashing and collecting again. That being said, there’s not much new here to tempt a demographic of players that aren’t already fans of the genre. But hey, this game isn’t made for that demographic. A Hat in Time is a glorious romp through some fun and imaginative worlds, so this is the perfect game for young children. If you have a daughter, nephew, younger sister or brother that you want to play with, play this with them (local/online co-op will be enabled in a later patch). If the 3D platforming genre is something you enjoy, buy it. If the charm has seduced you like it did me, buy it. It does everything you want, with a fun and tight gameplay loop, endearing atmosphere and oh so much character. The game, much like Playtonic’s effort earlier this year, knows exactly what game it’s trying to be. It also knows who its audience is, and it aims to please those directly. 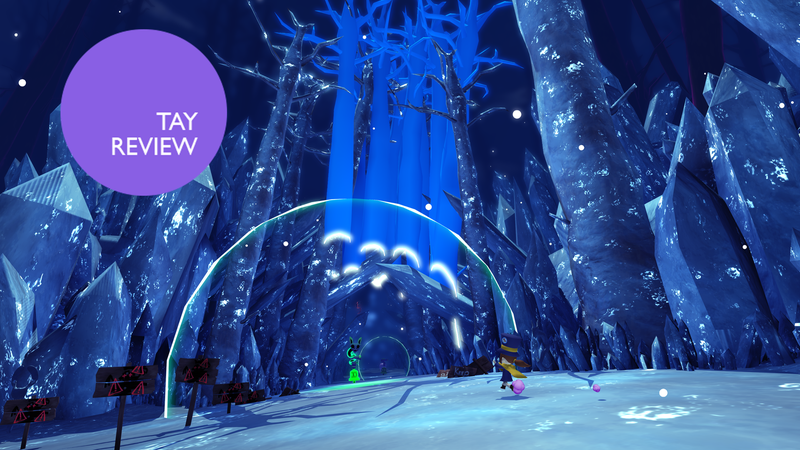 For those who may have backed this project on Kickstarter in search of a fun, whimsical 3D platforming game of old, then A Hat in Time could be your indie darling of the year. And what a fashionable darling she is.